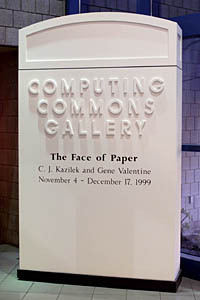 The first exhibit of large canvas images from the Paper Project was shown at the Arizona State University Computing Commons Gallery. 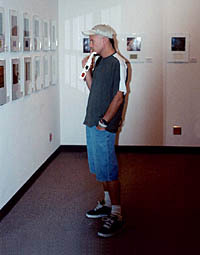 The images below are from the opening of the exhibit. 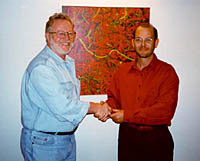 In addition, a lecture was given prior to the opening. The web version of the digital materials can be viewed here. 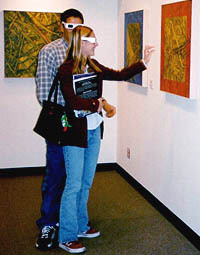 Visitors with high speed connections and those with some patience can visit the Face of Paper exhibit. These private tours are possible with Quicktime VR (virtual reality) movies. Click on any of the images below and follow the instructions. To take this tour you need Quicktime version 4 or higher. The approximate download time for each movie via modem (28.8) is five minutes.